Although no longer in the parish of St Matthew's, the chapel is the oldest religious building in Oxhey and there were probably some earlier monastic churches on the site. 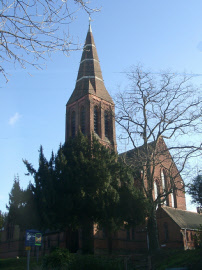 The first vicar of Oxhey, the Rev'd Newton Price, was once chaplain of the chapel, as was his main opponent in deciding whether Oxhey should be a separate parish, the Rev'd Richard Lee James, Vicar of St James, Watford. 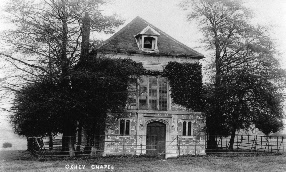 Early History 1612-1852 In 1612, Sir James Altham built Oxhey Chapel, probably on the site of a monastic church, for use by his family and servants at Oxhey Place. Cromwell's troops desecrated the chapel in 1649, after the Battle of Uxbridge. They used it as a store and barracks, pulled off the roof lead to make musket balls and made a door in the east wall. When Sir John Bucknall became new owner of the house in 1688 he bricked up the east door and installed the reredos at the east end, reusing woodwork from the great house, which he rebuilt. A bell-cote and a hipped and tiled roof were added in 1704. In 1712, the interior was restored and the reredos was whitewashed to make the interior brighter. In 1852, Thomas Grimston Bucknall Estcourt paid for the chapel’s restoration, for use by worshippers from the nearby small hamlet. He arranged for the replacement of the old pews and pulpit and had the reredos cleaned of its whitewash coating. The Exterior The outside walls are made of alternate squares of brick and knapped flint. There is no churchyard, because the chapel has never been a parish church, but at the west end is a paved enclosure in which are two graves: Thomas Anthony Blackwell (1942) and a double grave for Samuel Judd (1944) with his wife Frances (1946) - two well-respected estate workers. The Interior Inside, the main architectural feature is the roof with its moulded tie beams. The most important furnishing is a late seventeenth century reredos, with twisted columns supporting a broken pediment. The original Jacobean communion rails are now back in place. Along with the communion table, these were removed in 1898, with permission, to St Matthew's for use in the Lady Chapel. St Matthew's still has the table. The most important monument is to Sir James Altham (1616) and his wife Helen (1638). Their two kneeling effigies are facing each other in prayer, dressed in clothing of the period. The Blackwell's Changes & The 1960s Restoration The building reached its present form in 1897, when the vestries were built and the pews were arranged in collegiate fashion, the architect being J. E. K. Cutts. Cutts’ original photographs of the changes have survived and can be seen here. The work was paid for by Thomas Blackwell, of Crosse & Blackwell the food manufacturers, who then lived at Oxhey Place. By 1962 the chapel was in bad repair and in the severe winter of 1962/3 part of the roof fell in. An appeal raised £6,000 and extensive work was carried out including the complete replacement of the roof tiles. The original tiles were sold to the late violinist, Yehudi Menuhin and were reused at his house in Hampstead. The replacement bell-cote also dates from this restoration. The Churches Conservation Trust. Although the chapel came back into use, the parish decided that it was no longer essential and in 1977 it was put in the care of the Trust. The chapel is still consecrated and is sometimes used for weddings.